Transcribed by: Karen Patterson. For an explanation and caution about this transcription, please read this page. Link to a sketch of Saxonburg Borough from the Atlas of Butler County, G.M. Hopkins & Co., 1874. In 1830, two German-American citizens, who had spent several prosperous years in the United States, crossed the Atlantic on a visit to the "Fatherland." When they appeared among their relatives and old-time friends in their native town of Muehlhausen, Thueringen, formerly in Old Saxony, now in the Kingdom of Prussia, they found themselves fairly besieged for information concerning the young Republic of the New World. Being unable to reply to the increasing number of individual inquiries they held a public meeting, and in the form of addresses, conveyed the desired information to the large audience which had gathered to hear them Their account of their new home and of the advantages and resources of the new nation was so well received that steps were immediately taken to organize a colony with a view to emigration. In the following year, two brothers, Charles F. and John A. ROEBLING, of Muehlhausen, were selected to come to America as advance agents and purchase a tract of land suitable for the purposes of the proposed colony. 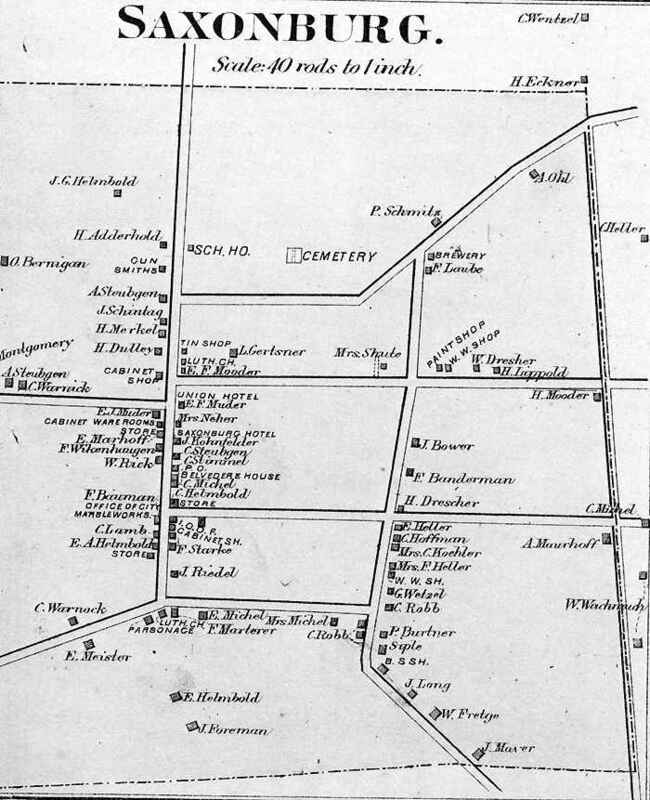 In the execution of this trust, the brothers came to Pittsburgh, where, after a thorough investigation, they purchased, for $1.25 an acre, from Mrs. Sarah COLLINS, who had inherited it from her father, Stephen LOWREY, a tract of land embracing about 16,000 acres, situated in what is now Jefferson township. After sending word back to Germany, the ROEBLING's selected a site for a village, and, adjoining it, a farm for themselves. The latter they set about improving while waiting for the coming of the colony. In the spring of 1832, 300 families from Muehlhausen and vicinity embarked at Bremen, in three vessels, for America. After a two months' voyage two of the their vessels landed at Baltimore, and the third at Philadelphia. Owing to many having selected different locations before leaving their native land, and to the activity of colonization agents at Baltimore and Philadelphia, only a few families found their way to the lands selected for them by the ROEBLINGs. They arrived August 24, 1832, at the site of Saxonburg. Their journey from Baltimore had been a long and tedious one, but they performed it with the quiet, enduring and uncomplaining patience characteristic of their race and which supplemented by unremitting industry and the practice frugality, enabled them, within a few years, to build up a prosperous community in the heart of the wilderness. [p. 467] These first settlers of Saxonburg, for whose coming Charles F. and John A. ROEBLING had prepared the way, embraced the following: Fred BASHER, A. EISENHART, G. KINNE, Rev. William FUHRMANN, C.G. LAMB, August KUNZ, A. STUEBGEN, Christian STEUEBGEN, A.C. BERNIGAU, J.H. MUDER, F. FRANKE and Charles TOLLEY. Of these Charles TOLLEY and Christian STUEBGEN came from Philadelphia, where they had arrived six years before. August KUNZ and C.G. LAMB were from Zwickau, Saxony. All of the others were from Muehlhausen. They all remained and became permanent settlers except KINNE, FUHRMANN and KUNZ. Charles F. ROEBLING, the older of the two brothers, married Wilhelmina FELBER within a few years after the founding of the village. He died in Saxonburg in 1838. His widow and two children are still living. She resides in this township with her daughter, Mrs. Herman KNOCH. Charles ROEBLING, the son, makes his home in Cincinnati. John A. ROEBLING, the younger brother, who came here single, married Hannah HERTING. He erected a residence of brick and wood, the walls being brick with wood outside and inside. He made the brick himself. This house is now the residence of Julius RIEDEL. Mr. ROEBLING, who was a native of Muehlhausen, where he was born June 6, 1806, had in in [sic] his youth been educated in architecture and engineering, for which, at an early age, he displayed great talent. Before coming to American he had made a thorough study of bridge architecture and construction, and had submitted plans for a suspension bridge across Buhr river to some of the leading engineers of Prussia. Suspension bridges had been previously planned and constructed but had proven failures. His plans looking to the substitution of wire rope or cable for the chain cable were regarded as chimerical and impracticable. His faith in the practicability of the wire cable did not desert him, and with the petinacity [sic] of one believing in himself he kept turning the idea over in his mind until he evolved a scientific wire rope or cable, for which he secured a patent in 1842. These he began to manufacture at his home in Saxonburg, being assisted by Mr. John RIEDEL. His first cable stood the test of practical use in the Sharpsburg ferry. He next secured a contract from the state board of public work for their use on the canals and inclined planes. He then began the construction of those great works which stand today as monuments to his inventive genius and engineering skill, and which brought about a revolution in bridge building. Among these may be mentioned the suspension wire aqueduct across the Allegheny river at Pittsburg, constructed in 1844; the suspension bridge across Niagara river, begun in 1852, and completed in 1855; the suspension bridge across the Ohio river from Cincinnati to Covington, begun in 1856 and finished in 1857; the bridge across the Allegheny at Pittsburg, begun in 1858 and completed in 1860, and last - the greatest and grandest of all - the East River suspension bridge, connecting New York and Brooklyn. This is the largest suspension bridge in the world, and is a marvel of modern engineering skill. It was completed in 1883. While personally superintending the work of laying out the towers for the bridge, ROEBLING's foot was crushed by a piece of timber. Lockjaw set in, resulting in his death July 22, 1869. His son, Washington A. ROEBLING, succeeded to the work of superintending the construction of the bridge, which was successfully carried on under his [p. 468] direction. In 1855, Mr. ROEBLING erected a large factory at Trenton, New Jersey, for the manufacture of wire rope, which is still carried on under the name of John A. ROEBLING Sons Company. John H. MUDER and his family, consisting of Veronica, his wife, and Gottfried, John E. and Henry, his sons, were among the original colonists who arrived in 1832. They opened a farm, which extended north from Main street, west of the PFABE House. John E. is the only survivor of the family, and of the pioneer colonists. E. HERTING, a tailor by trade, with his wife and three daughters - Hannah, Eleanor and Mary -also came in 1832. Hannah afterward became the wife of John A. ROEBLING. August C. BERNIGAU was another of the colonists. He came with his wife, Martha, and established a cabinet shop and general store. He died in 1846. Ferd. BAEHR and Rebecca, his wife were also among the original colonists. BAEHR and A. EISENHART, another colonist - a single man, who died in 1848, - formed a partnership and established a spinning and carding mill. George GRAFF came in 1832 and located on a farm where is now the LAUBE sub-division of the village. Theodore H. TOLLEY, Sr., a copper-smith by trade, his wife Virginia and son Theodore H. arrived in 1832. Herman MILLER came in 1832 or 1833. His wife died in the latter year, her death being the first in the colony. He moved south in 1836 and died in the forties. He brought the canary birds to the Northern States for sale, and made a business of selling birds until his death. C. G. LAMB came from Zwickau, in company with the KUNZ family 1832. LAMB was accompanied by his wife, Wilhelmina, and their infant daughter, bearing the mother's name. On December 17, 1832, their son Frederick LAMB was born. He was the first child born in Saxonburg. LAMB settled on a farm in the "Glades." Adolphus STUEBGEN and Christopher STUEBGEN, his son, came here in 1832. The father came from Saxony with the colonists. He died in 1846. Christopher, the son, came to America in 1826 and settled in Philadelphia, where for six years, he worked at the white-smith's trade. In 1832 he came to Saxonburg with his wife and two daughters - Amelia and Julia. Rev. William FUHRMANN, of the Evangelical church, who came with the colonists, was the first minister of the settlement. He brought with him his wife and son Charles. He was the life of the little colony in its darker days. It was through his persuasion that the colonists were induced to remain. He left them himself, however, in 1834, on account of lack of support. Charles GOEBEL, a single man, came here early and established himself as a weaver. Fred. KOENIG, a single man, who came in 1832 with the BAEHRS, was a machinist. He remained until 1835. G. FRANKE, one of the original colonists, settled in Sarversville. In 1833 Emil MAURHOFF arrived, and later established a general store, in company with F.D. SCHWEITERING, where is now the MUDER residence. F.D. SCHWEITERING, a settler of 1833, was well known as a successful merchant and trader. He married Hannah WALTERS and was one of the original members of the first church in Saxonburg. Rev. Joseph SHEELEY, who was credited with being an able scholar and a master of the German, Latin, Greek and Hebrew languages, was well known to the early settlers. He died in [p. 469] 1853 or 1854. H.F. ADERHOLD arrived in 1833, established a bakery and confectionery and subsequently opened the first hotel in the village. In the same year, also, came J.G. HELMBOLD, whose sons, E.A. and Theodore, were successful merchants in Saxonburg. In 1837 came Francis LAUBE, the old innkeeper, and Frederick A. HOFFMAN, whose son Charles served in the Mexican and the late wars, filled the offices of justice of the peace and county commissioner, and of postmaster of the village. F.A. KUNZ and Adam OHL came about the same time. Doctor KOCH, one of the ablest and most popular physicians of his day, practiced here from 1843 to 1850, when he moved to Missouri, where he died. The first school was established in the village in 1838, with Benjamin DOUTHETT as teacher. His endeavors to instruct the German youth in English do not appear to have proven successful. Within a year the school was turned over to a German named EMMINGER, who conducted it until 1841, after which the teaching of English under the common school system seems to have met with more favor. The total revenue for school purposes in January, 1894 was $1,368.79. The population in 1870 was 295; in 1880, 319; in 1890, 258, and in January, 1894, about 350. The assessed value of real and personal property in 1894 was $91,819; county tax, $367.28; State tax, $366.46. The industrial life of the colony began with the establishment of a brickyard by John A. ROEBLING in 1832, the first product being the brick used in the erection of his dwelling. In the meantime ROEBLING's mind was busy with those great problems of bridge construction, the successful solution of which afterwards made his name famous throughout the world. It was here that he invented and in 1840, made the first wire rope manufactured in the United States. This rope, says the Iron and Steel Bulletin, was three-fourths of an inch in diameter and about 500 feet long, and was used on a plane at Johnstown, Pennsylvania. It was made of parallel laid wires, served on the outside with annealed wire. This rope went to pieces as soon as the serving wore out. The next rope was made for use on one of the inclined planes of the old Portage railways, and was 1,500 feet long and one and one-half inches in diameter. It was constructed very much as wire rope is made now, and lasted a long time. Its success introduced wire rope on the nine remaining Portage planes. The next application of wire rope on a large scale was on the planes of the Morris canal in New Jersey, soon followed by its adoption of the Delaware and Judson Canal Company. Finding most of his [p. 470] business in the East. Mr. ROEBLING, removed his plant from Butler county to Trenton in 1848. The EISENHART & BAEHR spinning and carding mill and the blacksmith shop of Jonas TIETER were also among the first industries. The MAURHOFF & SCHWEITERING store was opened in 1833 in a double log house, now the resident of J.E. MUDER. They sold out in 1835 to GOSEWITCH & GRAEFE. GRAEFE sold his interest to A. BERNIGAU, who sold to HELMBOLD & MERKEL in 1847. A few years later Mr. MERKEL established a separate store, and Charles STIMMEL became HELMBOLD's partner. HELMBOLD & MERKEL did not occupy the old log house, but rented a new building erected by J. E. MUDER, and now occupied by PFEIFFER's store and swelling. Among the present business houses are the following; The two stores of Mrs. Theodore HELMBOLD & Sons, T. KRAUSE and George W. MAURHOFF, general merchants; Dr. E.B. MERSHON's well-stocked drug store; Charles PFEIFFER's flour and feed store; SACHS & WETZEL's lumber yard, and a number of other lesser places of business. William DRESHER has for many years successfully carried on the only wagon shop in the borough. The new opera house, erected in 1893 by KNOCH & ROETTIG, is a spacious one-story frame building, and provides the people of the borough with a creditable place of amusement. ADERHOLD's Hotel was established in 1842 as the "Saxonburg Exchange," opposite the present school building. He retired in 1858 an went into the nursery business. The VOGELEY House was opened next, on the site of the present LAUBE Hotel. The Union Hotel was erected in 1863, by E.F. MUDER, and continued by him, except during the term of F. LAUBE's lease, down to 1887-88. Mr. MUDER's heirs sold the property to Thielo KRAUSE, who remodeled the building for store and residence purposes. In 1848 Christian STUEBGEN established a hotel on the site of the PFABE House. It had several landlords. In 1866 Henry STUEBGEN sold the building and ground to Joseph KOHNFELDER. The old house burned in 1868, and the same year KOHNFELDER erected the present large brick hotel building, now owned by Fred PFABE, and run by him as the Saxonburg Hotel. He purchased the property in December, 1891, and remodeled the west portion, known as the opera house, using the entire building for hotel purposes. The LAUBE House, originally the VOGELEY House was purchased and remodeled in 1875 by Francis LAUBE, who carried it on until December, 1891, when Christian J. RAABE became the owner. 1847 - George VOGELEY, burgess; E. HERTING, William SOMMER, George GRAFF, G. LENSNER and Christ VOGELEY. 1848 - William SOMMER, burgess; George GRAFF, G. LENSNER, A. DRESCHER, T.H. TOLLEY and John VOGELEY. 1849 - Francis LAUBE, burgess; F. A. HOFFMAN, Joseph REETH, John WEBER. 1850 - H.T. MERKEL, burgess; Dr. William KOCH, F.E. SAUPE, Joseph SHEELEY and William FRITSCHE. 1851 - George GRAFF, burgess; J.E. MUDER, E. MAURHOFF, H. ADERHOLD. 1852 - Christian STUEBGEN, burgess; H.T. MERKEL, E. HERTING, A. DRESCHER, E.A. HELMBOLD. 1853 - F.E. SAUPE, burgess; A. SCHMERTZ, C. HOFFMAN, Valentine HOCH, E.A. HELMBOLD, and E. MAURHOFF. 1854 - H.F. ADERHOLD, burgess; H. WETZEL, George GRAFF, C. SIPPEL and Jacob NEHER. 1855 - A.W.. SCHMERTZ, burgess; C. STUEBGEN, F. STARKE, Joseph REETH and A. DRESCHER. 1856 - Valentine HOCH, burgess; William SOMMER, E.A. HELMBOLD and A. OHL. 1857 - A. OHL, burgess; Jacob NEHER, Henry WETZEL, Gottlieb HELLER and Henry PFABE. 1858 - John WEBER, burgess; C. SMITH, Henry GRAFF, G. WETZEL, Gottlieb HELLER and Henry PFABE. 1859 - E.F. MUDER, burgess; C. SMITH, Henry GRAFF, C. WETZEL, F. SCHLOESSER and Chris. SCHROTH. 1860 - E. A. HELMBOLD, burgess; Chris STUEBGEN, Henry ADERHOLD, Paulus RAABE, Gottlieb HELLER and Valentine HOCH. 1861 - Paulus RAABE, burgess; Christ STUEBGEN, Henry ADERHOLD, Paulus RAABE, Gottlieb HELLER and Valentine HOCH. 1862 -W. HELLER, burgess; H.F. ADERHOLD, John WEBER, G. HELLER and Gottfried WETZEL. 1863 - Christian SCHROTH, burgess; G. LAMB, F. BAUMAN, A. OHL and B. MICHEL. 1864 - E. MAURHOFF, burgess; H.F. ADERHOLD, C. STUEBGEN, T.H. TOLLEY, F. STARKE and H. DRESCHER. 1865 - H.F. ADERHOLD, burgess; C.G. LAMB, Jacob NEHER, G. WETZEL and F. LAUBE. 1866 - C.G. LAMB, burgess; E. MICHEL, A.W. SCHMERTZ, C. RAABE, E. HELLER and John WEBER. 1867 - F. BAUMAN, burgess; E. A. HELMBOLD, C. SCHROTH, Theodore HELMBOLD, William DRESCHER and Julius RIEDEL. 1869 - A. W. SCHMERTZ, burgess; E. HELLER, A. OHL, C.G. LAMB, John LANG and F. LAUBE. 1870 - Jacob NEHER, burgess; William SOMMER, E.F. MUDER, Christopher RAABE and Louis GERSTNER. 1872 - Joseph KOHNFELDER, burgess; A. OHL, F. BAUMAN, H. LIPPOLD, G. WETZEL and H. DRESCHER. 1873 - Julius RIEDEL, burgess; T.H. TOLLEY, C. RAABE, Erdman HELLER, William RICH, Louis GERSTNER and Fred. BAUMAN. 1874 - Louis GERSTNER, burgess; C. RAABE, A.W. SCHMERTZ, C.G. LAMB, Joseph KOHNFELDER, and E F. MUDER. 1875 - Louis GERSTNER, burgess; C.A. STIMMEL, H.B. MUDER, E. HELLER, A. OHL, Henry HORN and G. WETZEL. 1878 - E. STEUBGEN, burgess; Charles WETZEL, M. SCHOOK, E. HELLER, Francis LAUBE, Fred. BAUMAN and F. MEISTER. 1879 - Seth MEADE, burgess; John SACHS, Charles WETZEL, Joseph HICKMAN, Charles RAABE, V.B. SMITH and Herman SEIPEL. 1880 - H. G. MUDER, burgess; T. KRAUSE, John SACHS, C.G. LAMB, F. SCHROTH, F. MARTERER and H. DRESCHER. 1881 - Christian RAABE, burgess, L. RUEDIGER, Charles WETZEL, William DRESCHER, T. KRAUSE and Theo. M BETTINGER. 1882 - William SCHROTH, burgess; L. RUEDIGER, F. LAUBE, Sr., and F. SCHROTH. 1883 - Joseph KOHNFELDER, burgess; C. WETZEL, E.F. MUDER, Christian RAABE, Charles PFEIFFER, John SACHS and William SCHROTH. 1884 - Charles PFEIFFER, burgess; Philip COOPER, G.S. GIBSON, R. SCHROTH, J. WEBER, Charles WETZEL and J. SACHS. 1885 - Theodore HELMBOLD, burgess; W. SCHROTH, Sr., J.W. McKEE and Henry ASCHE. 1886 - Theodore HELMBOLD, burgess; John WEBER and Fred. SCHROTH. 1887 - Charles WETZEL, burgess; August WARNECK and August MEISTER. 1888 - J.H. KING, burgess; W. SCHROTH, Sr., J.W. McKEE and Henry ASCHE. 1889 - H.G. MUDER, burgess; William SAMES and H.A. MUDER. 1890 - William YEAGLE, burgess; J.W. McKEE, Henry ASCHE, H. MUDER, W. SAMES, William DRESCHER and C.J. RAABE. 1891 - C. RAABE and Theodore HELMBOLD, Received each thirty-six votes for burgess, but RAABE was elected by lot; L. RUEDIGER and William STUEBGEN. 1892 - Theilo KRAUSE, burgess; Louis WETZEL and Henry LANG. 1893 - John SACHS, burgess; Charles WETZEL, William DRESCHER, H.G. MUDER. Louis RUEDIGER, William STUEBGEN and Henry LANG. 1894 - William D. HOFFMAN, burgess; Herman G. MUDER, Richard W. NEUBERT, Charles WETZEL, Louis RUEDIGER, William DRESCHER and Henry LANG. The names of the justices of the peace elected for Saxonburg since 1847 are as follows: Rev. Joseph SCHEELEY, 1847; Emil MAURHOFF, 1847; Frederick E. SAUPE, 1851; Emil MAURHOFF, 1852; Theodore H. TOLLEY, 1854; Francis LAUBE, [p. 473] 1857; Charles HOFFMAN, 1859; Francis LAUBE, 1862; Charles HOFFMAN, 1864; Theodore H. TOLLEY, 1865; H. Theodore MERKEL, 1868; Theodore H. TOLLEY, 1860; H. Theodore MERKEL, 1878; Theodore H. TOLLEY, 1875; H. Theodore MERKEL, 1878; Theodore H. TOLLEY, 1880; H. THEODORE MERKEL, 1883; H.C. CLARK, 1885; Mr. CLARK moved away, and H. ADERHOLD was elected to fill vacancy; H.C. LENSNER, 1889; V.B. SMITH, 1892, and H.C. LENSNER, 1894. The German Evangelical Protestant Church of Saxonburg, while organized in 1837, really dates back to 1832, when Rev. William FUHRMANN began preaching here. The pastors who followed him were Revs. Joseph SCHEELEY, 1834 - 1841; Robert CLEMENTS, 1842; BOTTCHER, FRANK, BALMSEN and KAISER, 1842 to 1847; J. RIEDEL, 1847 to 1851; A. RUDOLPH, 1851 to 1854; R. ENGEL, 1854 to 1856; REICHMAN, 1857 to 1858; J. KISSEL, 1858 to 1860; HELFER, 1861; A. RUDOLPH, 1862 - 1864; Ernst SERFLING; 1865 to 1868; A. HERMAN, 1868 to 1869; Carl LINN, 1869 to 1871; SYLLA, 1871 to 1872; Gustave BOCHERT, 1872 to 1876; R. POLSTER, 1876 to 1878; G. WICHE, 1878 to 1880; Ernst WEISS, 1880 to 1890, and Karl A. HORN, the present pastor. The members in October, 1837, were C.G. LAMB, John E. MUDER, F.D. SCHWEITERING, John A. ROEBLING, William ROEBLING, Fred BAEHR, J.H. MUDER, C. GOEBEL, C. STUEBGEN, F.A. KUNZ, Adam OHL, J.G. HELMBOLD, H. ADERFOLD, E. MAURHOFF, A. EISENHART, and A. BERNIGAU. The society was incorporated in November 15, 1851, when the articles of association were signed by Elder John GERSTEN and secretary H. Theodore MERKEL, who with Gottfried FRANCKE were the trustees. A frame building was erected between 1834 and 1837, to which a steeple was added in 1863. Frederick STARKE, the first organist, died in 1886, when his son, August, succeeded him. Mrs. Charlotte HORN became organist in July, 1893. St. Luke's Evangelical Lutheran Church, of Saxonburg, was founded in 1869, when several of the English speaking members of the older church near Hannahstown, withdrew to form a congregation at Saxonburg. A building committee was at once appointed, consisting of John E. MUDER, Isaac LEFEVRE, and William BURTNER, Michael STEPP and Thomas GREER. Work was begun at once, and before the close of 1869, the brick building, west of the PFABE House, was completed, the cost being about $2,800. Rev. J. MELHORN, of Freeport, who organized this church, preached here until succeeded by Rev. J.H.A. KITZMILLER, who remained eleven years. For some years the pulpit was supplied by various ministers until Rev. Mr. SHANOR, of Freeport, was appointed pastor, he attending to his charges at Freeport and Sarversville at the same time. Rev. Mr. SHAFFER was the next pastor, then came Rev. Mr. FETZER, of Greenville, who was followed by Rev. J.L. DOERR. Rev. Mr. MARTENS, the present pastor , came in 1892. The burial ground of the German Evangelical congregation dates back to April 1, 1836, when F.C. ROEBLING, his wife, Wilhelmina, and John A. ROEBLING conveyed to the German inhabitants one acre of land for a school building and cemetery. The agreement relating to this cemetery was signed in 1845, by John A. ROEBLING, J.E. MUDER, John GERSTNER, O. STUEBGEN, Joseph REITH, [p. 474] George GRAFF, J.B. LENSNER, William BAUER, F.H. MUDER, C. VOGELEY, F.E. SAUPE, Fred BAEHR, A. EISENHART, George VOGELEY, E. MAURHOFF, E. HERTING, A. BERNIGAU, F.G.C. LASZIGAR, John HAUSER, H. ADERHOLD, William SOMMER, and Andrew DRESCHER. Under the donors' agreement with the people, this old burial ground is free. It adjoins the borough cemetery; but the borough continues to elect two trustees and the church one trustee to manage it. The New Saxonburg Cemetery is a creation of the seventies. It comprises two and a half acres, the unsold lots in which belong to the HELMBOLD heirs. H. ADERHOLD founded this cemetery, and his heirs sold it to Theodore HELMBOLD. Saxonia Lodge, Number 496, I.O.O.F., was chartered October 20, 1853. The first officers were Emil MAURHOFF, N.G. ; Valentine HOCH, T.; H.T. MERKEL, S., and E.A. HELMBOLD, V.G. The present noble grand is Albert KRAUSE, and the present secretary Charles HOFFMAN. The hall of the lodge room was dedicated in October, 1861. It is well furnished, and the lodge is in a prosperous condition, the present membership numbering 165. Saxonia Encampment, Number 237, I.O.O.F., was chartered April 9, 1873, the officers being Jacob SUMMA, C.P,; Philip DROLLINGER,. H.P. ; Joseph ELLIOTT, S.W. ; John W. WELSH, J.W. ; August STUEBGEN, S., and Calvin LOGAN, T. The charter was surrendered at the close of the third year, but was restored July 29, 1890, when Dr. E.P. LOGAN was chosen C.P. ; J.E. MUDER, Jr., S., and T. KRAUSE, T. Mr. MUDER and Mr. KRAUSE have filled the positions of secretary and treasurer since the restoration of the charter. Twenty-nine members have been admitted since July, 1890, the present membership being about fifty. Lady Montgomery Rebekah Degree Lodge, Number 248, I.O.O.F., was chartered March 5, 1892. The officers were Thielo KRAUSE, N.G. ; C. MONTGOMERY, V.G. ; Charles HOFFMAN, S.; Mrs. E.E. CHESNEY, A.S., and Mrs. M.C. KRAUSE, T. The present noble grand is Mrs. E.E. CHESNEY, and the present secretary Mrs. Emma MUDER. Herder Lodge, Number 279, K. of P., was instituted December 29, 1870. The charter members were Rev. Carl LINN, of Jefferson Centre Presbyterian church, P.C. ; E.A. HELMBOLD, C.; Richard SWEET, V.C. ; T. H. TOLLEY, K.R.S; Joseph KOHNFELDER, A.W. SCHMERTZ, Francis LAUBE, Henry DRESCHER, William DRESCHER, H. ADERHOLD, Adolph RICHTER, E. HELLER, W. WACHSMUTH, Henry HESSE, Christian RAABE, Henry HORN, F. RUEDIGER, Christian RUDERT, H. LIPPOLD, William SCHROTH, John FLOHR, G. WETZEL, C. LEDERER, Gottfried REINHOLD and Christian SCHROTH. Excelsior Tent, Number 115, K.O.T. M., was organized February 21, 1890, with fifteen members, namely; J.C. DeHART, Elmer E. GRAHAM, T.V. SMITH, J.W. McKEE, William J. REDICK, A.H. ASCHE, Dr. E.P. LOGAN, R.E. NEUBERT, Emil NEUBERT, M.L. SMYERS, J.R. SMITH, L.A. HELMBOLD, E.H. ELLENBERGER, William BECK and James GALLAGHER. From June, 1891, to June 1892, Elmer E. GRAHAM filled the office of State Commander of the order. The Tent comprises ninety members. Saxonia Council, Number 496, Fr. O.U. A. M., was instituted December 23, 1890, with the following officers; Elmer E. GRAHAM, P.C. ; Dr. A. FOSTER, [p. 475] C.; J.W. McKEE, V.C; William KRAUSE, R.; Albert KRAUSE, A.R. ; H. W. LOVE, F.S. ; Emil BECHMAN, T.; William RICHIE, C.; J.R. SMITH, W.; Daniel OVERHEIN, I.S. ; A.T. McKEE, O.S. ; E.E. GRAHAM, D. OVERHEIM and A. FOSTER, trustees, and E.E. GRAHAM, representative to State Council. In February, 1894, the lodge had fifty-four members. Saxonburg has had its musician and festival days since the beginning of its history. Der Schuetzenfest, observed form 1844 to 1876, was made an occasion for mirth, music, games and amusement, in which 5,000 persons often participated. The programme usually embraced target practice, dancing, singing, and those games and amusements learned in earlier days in the Fatherland. As conducted by the German residents, it was an occasion of innocent pleasure and amusement in which they took pride. Its annual return generally brought the German signing clubs from Pittsburg, as well as many visitors from different parts the State. The oil excitement brought hither a new element not calculated to maintain the purity and innocence of its festivities, and it was regretfully discontinued after an uninterrupted annual observance extending over thirty years. Contemporary with the Schuetzenfest was the Thespian society, a dramatic organization, and a number of singing clubs. The Thespian society was organized in 1835, by E.A. HELMBOLD, E. MAURHOFF and Charles MOSHER. In 1846 it was known as the "Thespian Dramatical Association." Its members, composed of local talent, gave occasional dramatic entertainments in both German and English until 1880. Saxonburg has been a local musical center, and it has at different times maintained one or more good brass bands. The people are lovers of good music, and in nearly every home may be found some one who excells [sic] either as a vocalist or as a performer on some musical instrument.